As I've mentioned (probably to the point that you're sick of reading about it by now), the Waterslide/PopKid show in Tokyo was not only one of the highlights of my trip to Japan, but it was one of the best nights of my life. Of the bands that played that show, the only band that I was very familiar with beforehand was The Hum Hums. I had already had their fantastic second album Back To Front and was so happy to hear they were every bit as good live as they were on that record. 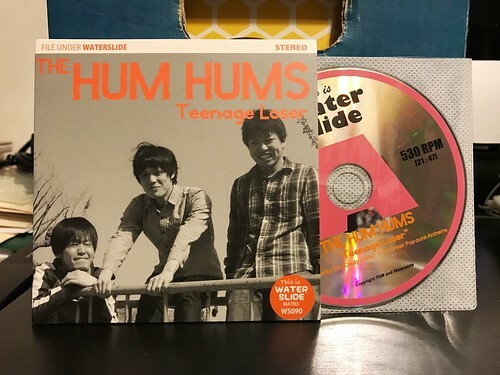 Since I didn't have their first album, I had to pick up Teenage Loser when I got home. I've spent a lot of time with this one and I can say without question, it's also pretty damn great. I think I can safely say that The Hums Hums probably have the best vocal harmonies in all of punk rock. We're talking perfect Beach Boys style backing vocals that bring you into the song and get stuck in your head for days on end. These vocals and the band's uncanny knack for bubblegum pop punk hooks really make The Hum Hums something special. I think I like their second album a little bit better. It's slightly more dynamic and you can tell that as songwriters they definitely grew from the first. But Teenage Loser is no second fiddle album, it's a stellar collection of pop hits and I consider myself very lucky that I was able to see them play in Japan. I hope I can see them again someday, but for now I'll just have to keep listening to their records nonstop.